I've been scouring the Web for this info, and even looked through several of the books linked in the library section, but I still can't find what I'm after. 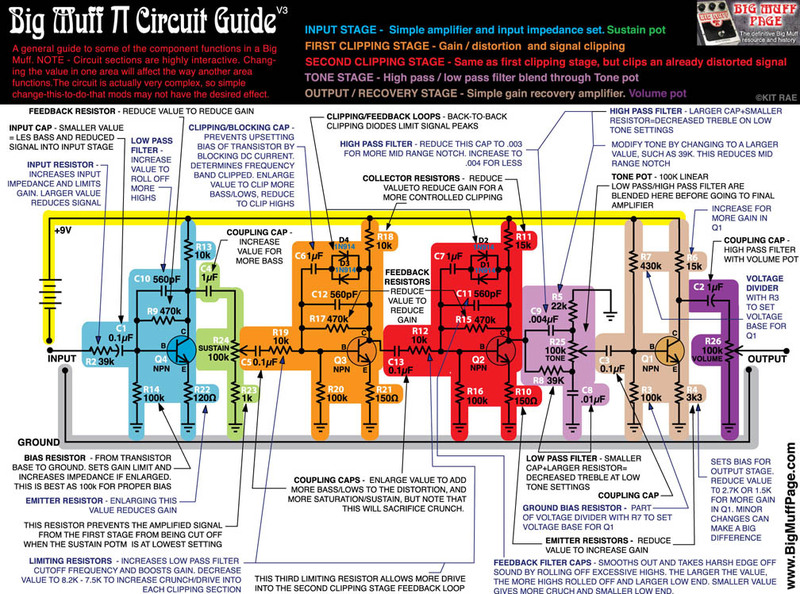 What I'm after is something that takes simple circuits, preferably actually existing pedal circuits, and starts from the beginning, explaining where the current comes from, where it goes to, what happens to it at each and every component. Does this capacitor act as a high-pass filter? What's the point of this 10K resistor, and if I change the value what should happen? Etc. I'm hoping to find something like this that's pedal-related, rather than generally electronics-related, but anything anyone can suggest would be much appreciated. RG Keen's geofx "technology of..." articles assume a bit more technical knowledge, but it's a simple matter to read wikipedia explanations of common building blocks RG references if you're not sure. For lots of general pedal-related "how does it work?" information, the beavis audio, geofx and amz websites are chock full, and just require a bit of searching. hey simon, welcome to the forum. i posted a similar-ish (or related, extending from) question a couple of months ago and got some useful answers and links from members here. if it's helpful to you, here's the post. RG's comments about 'a minimum cut set' have proven a great 'tool' since for dissecting schematics.